WASHINGTON (AP) — House Republican leaders have unveiled their proposal to expand the massive tax law they hustled through Congress last year. They're aiming to make permanent the individual tax cuts and small-business income deductions now set to expire in 2026. HUNTINGTON, W.Va. (AP) — West Virginia lawmakers are calling for harsher drug laws following a possible overdose-related car crash that stopped feet away from a playground. Sen. Mike Woelfel, D-Cabell, tells The Huntington Herald-Dispatch that he wants to create a "punishment that fits the crime." WASHINGTON (AP) — House Republicans have launched an effort to expand the massive tax law they muscled through Congress last year, aiming to make permanent the individual tax cuts and small-business income deductions now set to expire in 2026. HUNTINGTON, W.Va. (AP) — Smoking and vaping are no longer allowed at parks in a West Virginia city. Greater Huntington Park and Recreation District director Kevin Brady tells news outlets the new tobacco-free policy will limit smoking and vaping to parking lots only. He says the Board of Park Commissioners voted to approve the policy Wednesday. Rep. Kevin Brady said Tuesday there is potential for major economic growth if lawmakers use the tax reform bill to their advantage. "I do think we can be well above 3 percent. I think it really depends on ensuring that we're building off the momentum from tax reform," Mr. Brady, Texas Republican, said on Fox Business. He also said the new tax code gives Americans a chance to compete globally and opens up opportunities to compete against countries like Mexico and Canada. HUNTINGTON — While recent weather has been a mix of warm and cold temperatures, employees with the Greater Huntington Park & Recreation District are preparing for the long-awaited warmup by making sure each of its parks is in tip-top shape. "We're as anxious as much as anybody for the warm weather and people being able to go out and enjoy the parks and playground," said Park District Executive Director Kevin Brady. Since 2015, The Woodlands chapter of Citizens' Climate Lobby, a volunteer-staffed environmental group that strives to influence climate policy, has been popping up at events in The Woodlands, such as farmers markets and expos. Citizens' Climate Lobby is a national grassroots, nonpartisan, nonprofit organization that aims to gather support toward climate protection by way of community outreach and working with members of congress. HUNTINGTON — It's been nearly two years since the Greater Huntington Park & Recreation District unveiled plans for an inclusive playground for kids of all ages and abilities. Since then, the playground has seemed like nothing more than a dream drawn out on paper, but come June, it could be much more. "We plan to break ground on phase one of the project June 1," said Park District Executive Director Kevin Brady during a Huntington City Council meeting Monday. HUNTINGTON - It's been nearly two years since the Greater Huntington Park & Recreation District unveiled plans for an inclusive playground for kids of all ages and abilities. HUNTINGTON — Ritter Park is going to the dogs - and if you are a fan of man's best friend that is a good thing. At 6 p.m. Tuesday, March 27, the Greater Huntington Park and Recreation District presents its second annual Paws in the Park Easter Egg Hunt. Bring your leashed dogs to the Ritter Park Fountain Area for this free event that will feature more than 2,000 doggie treat-filled Easter eggs with several additional pet prize eggs hidden. President Donald Trump is trying to turn attention back to tax cuts and away from the staffing turmoil in his administration, promising that more tax relief is on the way. Speaking Wednesday at a Boeing factory in St. Louis with two fighter jets as his backdrop, Trump celebrated the impact of last year's tax cut bill. President Trump said Wednesday that he plans to push for "phase two" of tax cuts, the second time in three days that he's advocated a new round of tax relief that could include capital gains cuts. "We are actually going for a 'Phase Two' that will help, in addition to the middle class, will help companies," the president said at a Boeing factory in St. Louis, Missouri. "And I think it will be something very special." Trump: Time for another tax cut? The more President Trump jokes about working on another tax cut, the more it sounds like he's serious. At a White House event Monday celebrating the World Series champion Houston Astros, Mr. Trump singled out House Ways and Means Committee Chairman Kevin Brady, Texas Republican, who led the congressional effort to pass tax cuts last year. "Kevin, are we going for an additional tax cut, I understand? Phase two?" Mr. Trump said. "We're actually very serious about that, Kevin." HUNTINGTON — Last week, the National Weather Service predicted the Ohio River in Huntington would reach near historic flood levels, but most of the heavy rain passed to the north. However, several areas of Harris Riverfront Park were still flooded, according to Kevin Brady, executive director of the Greater Huntington Park & Recreation District. "Everything from the floodwall down to the top half of the park is being cleaned up right now," he said. On the cusp of March's mid-term primary elections, U.S. Rep Kevin Brady, R-The Woodlands, spoke at a town hall meeting in The Woodlands, discussing the new tax reform bill and touting the benefits the new tax structure will bring to businesses and families. Officials with the Lone Star College System Small Business Development Center hosted the event, called a "Small Business Town Hall," on Thursday, Feb. 22, at the Lone Star Community Building in The Woodlands. HUNTINGTON — Build it, and they will come play. And the rest of the money will appear. That is the hope of the Greater Huntington Park and Recreation District, which is going to break ground this spring to build Phase One of the St. Clouds All Inclusive Playground. HUNTINGTON - Build it, and they will come play. The San Jacinto County Republican Party hosted the annual Reagan Dinner on Feb. 17 with guest speakers Jason Chaffetz, Kevin Brady and Phil King discussing recent accomplishments, upcoming elections and past events. Chaffetz is a former U. S. Representative for Utah and a former Chair for the House Oversight Committee. He is currently a contributor to Fox News. Hundreds of people turned out to hear what turned out to be a mostly positive forecast for the local economy during the 32nd annual Economic Outlook Conference held in The Woodlands Friday, Feb. 16. A woman from The Woodlands who describes herself as a "professor, a lawyer, a wife and a mom" is running as a Democrat in the hopes of representing District 15 in the Texas House of Representatives. Lorena Perez McGill, a 48-year-old mother of two, is the first Democrat to run for the district seat in 12 years. The district, entrenched in deep red Republican territory, covers The Woodlands, Oak Ridge North and other areas of south Montgomery County. Hundreds of people are expected to attend what's being described as the premier business event in The Woodlands area. The annual Economic Outlook Conference, created and produced by The Woodlands Area Chamber of Commerce, is set for Feb. 16. at the The Woodlands Waterway Marriott Hotel & Convention Center. The conference, which the chamber will be hosting for the 32nd consecutive year, is expected to provide valuable insights into the local and state economy. U.S. employers added 200,000 jobs in January, the government reported Friday, beating expectations as the unemployment rate remained unchanged at 4.1 percent. Average hourly earnings rose by 9 cents to $26.74, for a one-year growth rate of 2.9 percent. That's the highest rate of wage growth recorded by the Bureau of Labor Statistics since June 2009. Analysts had expected the economy to add about 180,000 jobs last month after a relatively weak December. The House's top tax writer said Friday that the modest gains in U.S. jobs last month was just a primer for the economic growth expected when the new tax cuts kick in. "With a new tax code that's built for growth, 2018 stands to be an even better year for creating good-paying jobs, increasing paychecks, and helping our businesses compete and win here at home and around the world," said House Ways and Means Committee Chairman Kevin Brady. WASHINGTON – As the days wound down on 2017, the promise of a simple, fairer tax code got more complicated. The sweeping tax cuts that Congress passed just before Christmas capped a tumultuous first year for President Donald Trump, and a career capstone for Texas U.S. Rep. Kevin Brady, a Republican from The Woodlands. Former district director for Brady taking job with The Woodlands. A longtime member of the staff for U.S. Rep. Kevin Brady, R-The Woodlands, is going to work for The Woodlands as the township's manager of Internal Governmental Relations. According to a press release from Brady's office, Todd Stephens has left his job as district director for the popular Montgomery County Republican congressman to join the staff of The Woodlands Township. The Woodlands Board of Directors bid farewell to outgoing Director Laura Fillault and welcomed its newest member, Carol Stromatt, during a reception at township's offices Wednesday evening. Stromatt ousted Fillault after she had served one term in office by winning 54 percent, or 2,700 votes during the November election for the Position 7 seat on the board. Fillault collected 45 percent, or 2,214 of the votes cast. WASHINGTON – In a big victory for Houston-area Republican Kevin Brady, the House passed a sweeping tax overhaul Thursday on a narrow party-line vote, setting up a showdown in the Senate that will test the unity of the GOP's slim majority. The 227-to-205 vote brought President Donald Trump a step closer to a long-held GOP campaign promise: Dramatically cutting the rates for corporations, individuals and families, while taking away many deductions and credits. WASHINGTON –Asked to define the "middle class," Texas U.S. Rep. Kevin Brady, the top tax-writer in Congress, told reporters recently that there is no precise answer because much of it depends on where you live. WASHINGTON (AP) — The chairman of the House's tax-writing committee said Sunday that he's confident that chamber won't go along with the Senate's proposal to eliminate the deduction for property taxes, setting up a major flashpoint as Republicans aim to put a tax cut bill on President Donald Trump's desk before Christmas. The GOP is moving urgently to push forward on the first rewrite of the U.S. tax code in three decades, but key differences promise to complicate the effort. ABC's "This Week" — Tom Perez, Democratic National Committee chairman; Gov. John Kasich, R-Ohio. BOSTON -- While Republicans in Washington, D.C., are planning to move quickly to advance their overhaul of the American tax code, voices from Massachusetts are calling for someone to apply the brakes. During the second day of his committee's markup of the GOP tax plan, U.S. House Ways and Means Chairman Kevin Brady of Texas said Tuesday that he expects the tax bill to get a vote in the House next week. WASHINGTON (AP) — After a day of partisan bickering over whether the Republicans' sweeping tax plan would truly help the middle class, a key House panel on Monday approved late changes. Lawmakers restored the tax exemption for employees receiving child care benefits from their companies, but also put new requirements on a tax credit used by working people of modest means. A key House panel has approved late changes to the Republicans' sweeping tax overhaul plan. They restored the tax exemption for employees receiving child care benefits from their companies, but also put new requirements on a tax credit used by working people of modest means. The House Ways and Means Committee kicked off debate Monday on the GOP's proposed overhaul to the U.S. tax code, with Chairman Kevin Brady saying the time is now for lawmakers to pass "transformational" tax reform for the American people. "Today, we stand on the doorstep of delivering the most sweeping tax overhaul in more than 30 years," said Mr. Brady, Texas Republican. WASHINGTON (AP) — House Speaker Paul Ryan said Republicans are discussing whether their tax plan should include a repeal of the Obama health law's requirement that people have insurance coverage or face a penalty, a step pushed by President Donald Trump but seen by some GOP lawmakers as possibly imperiling a much-needed legislative victory. A change made Wednesday to the Republican tax plan would mean less generous cuts for many Americans. The House's top tax-writer, Rep. Kevin Brady, has released a revised version of the bill that would impose a new, lower-inflation "chained CPI" adjustment for tax brackets immediately instead of in 2023. That means more income would be taxed at higher rates over time. WASHINGTON (AP) — House Republicans on Friday quietly made changes to their far-reaching tax overhaul: Now its tax cuts would be less generous for many Americans. 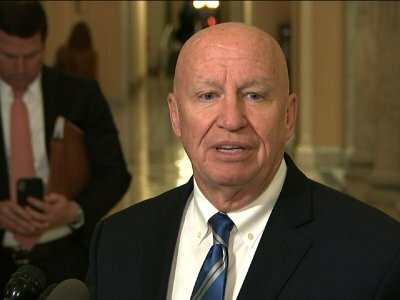 WASHINGTON - Tax overhaul legislation moving through Congress could incorporate repeal of the Obamacare individual mandate as deliberations on the issue continue, the chairman of the U.S. House of Representatives' tax writing committee said Friday. House Ways and Means Committee Chairman Kevin Brady introduced Friday a slightly modified version of the GOP's tax bill his committee will take up next week that makes adjustments to inflation calculations and other technical changes. The new version moves up the effective date for when the chained consumer price index, a method of tying tax and spending issues to inflation, from 2023 to 2018. WASHINGTON (AP) — How much of the House GOP tax plan is tailored to benefit America's middle class? That's uncertain based on the details that have been provided so far. What is clear is that many of the benefits for the middle class could dwindle over time, even while companies and wealthy individuals could enjoy lasting tax advantages. The plan promises tax savings next year of $1,182 for a typical household of four with gross income of $59,000, leaving their tax bill at $400. The chairman of the House Ways and Means Committee dismissed the idea Friday that the GOP's push to eliminate the estate tax is a giveaway to "super wealthy" Americans. 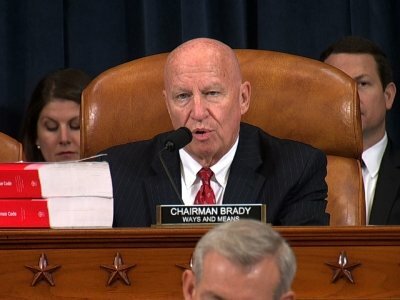 Rep. Kevin Brady of Texas said if people don't want to do anything about income disparity in the United States, then they should stick with the current tax code. House Republicans are leaving intact 401(k) retirement plans popular with the middle class. That's according to a senior House GOP lawmaker. The development comes as Republicans are scrambling to assemble a complete draft of their long-awaited plan to dramatically rewrite the tax code.